HemisFair Park is the site of the 1968 World’s Fair. It has pretty much been a standard park for a long time, a little bit of walking, a playground, buildings to look at, things of that nature. The 20 houses that were saved from demolition prior to the fair are in the park, and are all currently empty. A number of the other pavilions from the fair are also still there. There is a playground and also part of the Mission Espada Acequia (I’m not sure if I’ve covered the acequias before. They were irrigation ditches that started at the San Antonio River and traveled towards the missions). My now-ex and I, on our first visit to HemisFair Park, got attacked by mosquitoes. We’d been living in San Antonio for a few years by then and had, up until that point, never seen a single mosquito. I guess the relative lack of mosquitoes is something to be said for living in a paved, clear-cut semi-arid place. Probably the only thing to be said for the paving, clear-cutting, and semi-aridness, but it’s something. There are two water features in HemisFair park as well. We found the first one a few years ago after the Asian New Year Festival when we took a shortcut through HemisFair Park back to our bus stop. The other we just discovered on Christmas Day of 2015. Alex and I went downtown to see the Christmas lights and got there several hours too early. So, we walked down to the Institute of Texan Cultures and then up through HemisFair Park. We took a right turn when we normally make a left and discovered a beautiful fountain with water cascading down a sort of ziggurat-ish structure. We hung around there for a while, taking the path to the top and just enjoying the water. The Mexico Pavilion from the fair is one of the only buildings that I can find in the park that’s still open to the public. This building is now the Mexican Cultural Institute (and it is the only national pavilion, aside from the United States Pavilion, that is still in the park). Kitty-corner behind the Mexican Cultural Institute is the San Antonio branch of the Universidad Nacional Autónoma de México (“UNAM”). The San Antonio campus of UNAM is primarily a language school. I considered taking Spanish classes there at one time, but never have had the free time to do so. And if I were to do forward in my Spanish education, I would probably want to get a degree, probably a master’s degree. There are three buildings left over from the fair which are not part of the park. Two stand on the southern edge of the park, along César E. Chávez Boulevard. One of these two is the John H. Wood Jr. Federal Courthouse, which originally was the Confluence Theater of the United States pavilion of the fair. The other is now the Institute of Texan Cultures (“ITC”), which originally was the State of Texas Pavilion. The third building is the Henry B. González Convention Center. Both the courthouse and the convention center have fallen into disrepair, which leads me to what is likely to be my final point with regard to the park. Much of this information is soon to be out-of-date. The city is currently overhauling the park. There is a new convention center which, I think, is now complete. Soon the will raze the old convention center. The city also has $135 million earmarked for a new courthouse. They will overhaul most of the park, as well. The plan is to put an apartment building in the park and there will be some retail businesses added. I read something just today about the city wanting to put restaurants and other businesses in the empty houses in the park, and part of the population of the city is agitating to remove the ITC building and move the museum to a new location more central in the park. The University of Texas at San Antonio, which owns the ITC, is resisting any such changes. The ITC is surrounded by a metal fence. I would like to see that fence done away with. One of the big arguments of those who want to see the museum razed is that it doesn’t feel like part of the park. Removing that damned fence would go a long way towards making the museum feel like part of the park (the other would be removing the parking lot, but in a car-centric city like San Antonio, I don’t think that will happen). I believe that the ITC is one of only three museums that I’ve been to that have fences around them. 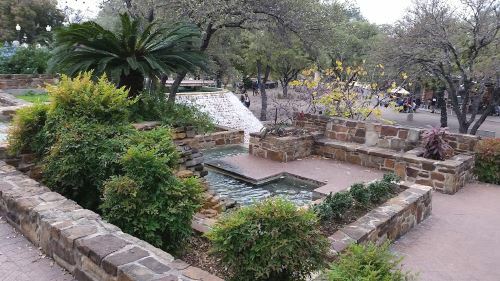 One other is the McNay Art Museum, which used to be a private home in a not-very-pedestrian-friendly area, and the other is the Vatican Museums in Italy, and it would be weird to take down the centuries-old wall there to make the museums more accessible. I’ve been to a lot of museums mostly, but not necessarily all, in Chicago, New York City, San Antonio, and the District of Columbia. I’ve even been to the Reading Museum (because I wasn’t about to miss a chance to see England’s copy of the Bayeux Tapestry). And people can just walk up to just about all of the ones I can think of. Maybe I should have left this to my post on the ITC, which is scheduled for April 15, more or less, but I’m on a roll now, so I’ll just leave it. This will probably end up being a Part 1. Part 2 will follow in another two years or so, once they have the official opening of the renovated park.